Gabrielle Macdonald (Craigielaw), a past winner of the Scottish title, has won the Midlothian women's county championship at Baberton. This is one of the most difficult Scottish county titles to win ... this is the first time Gabrielle has won it. She beat Kate Rorke (Kingsknowe) by 6 and 5 in the final. Gail Joughin (Comiston) beat Liz Calder (Turnhouse) 2 and 1 in the "B" Championship final. +Gabrielle is pictured with her father who caddied for her. Kate Rorke (Kingsknowe) bt Louise Fraser (Kingsknowe) 4 and 3. Jennifer Bryans (Harburn) bt Kate McIntosh (Broomieknowe) 4 and 3. Hannah Scott (Broomieknowe) bt Debbie Hay-Smith (Murrayfield) 3 and 1. Gabrielle Macdonald (Craigielaw) bt Caroline Steedman (Murrayfield) 5 and 4. Rorke bt Bryans 4 and 2. Macdonald bt Scott 2 holes. Macdonald bt Rorke 6 and 5. Gail Joughin (Comiston) bt Laura Reekie (Baberton) 4 and 3. Liz Calder (Turnhouse) bt Celia McIntyre (Craigmillar Park) 8 and 6. Joughin bt Calder 2 and 1. 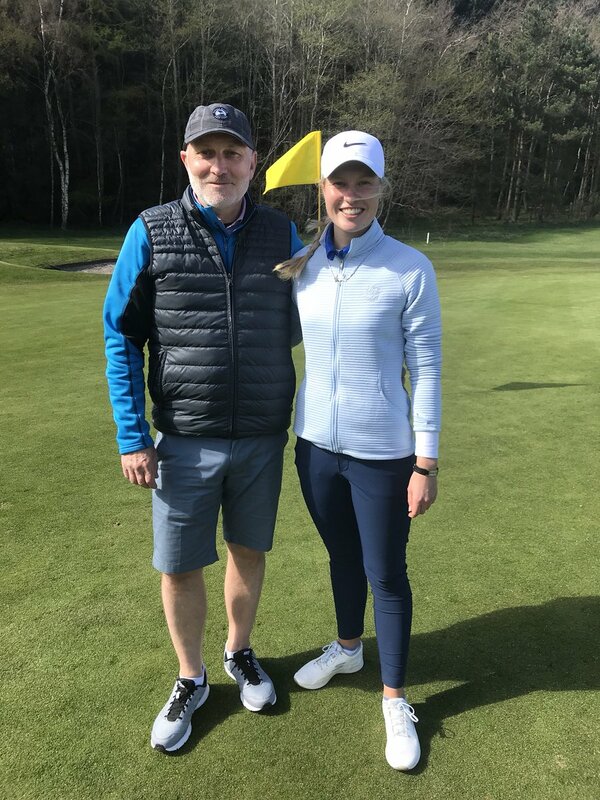 Lorna Ronnie, pictured right, has won the Ayrshire women's county title for the first time, beating Alex Glennie by one hole in an all-Kilmarnock Barrassie final at Western Gailes. Gillian Paton (St Regulus) has achieved the rate feat of being champion of different counties in successive years. Gillain won the Angus women's county title in 2017 and this year, having become a Fife county member, she beat former Scottish and county champion Elaine Moffat, also a St Regulus member, by 3 and 2 in the final at Elmwood. Ann Shepherd (Lochgelly) beat Jude Allardice (Ladybank) by 2 and 1 in the Fife county handicap final. Kirsten Brown retained the Lanarkshire women's county championship by beating the leading qualifier, Susan Wood (Drumpellier), by 4 and 3 in the final at Lanark Golf Club. In the semi-finals Kirsten beat Justine Fulton 2 and 1 while Susan bt Alydon Hendry 3 and 2.